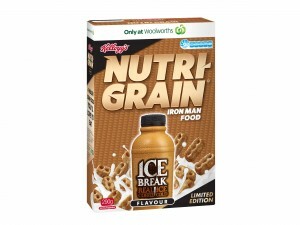 Kellogg’s and Ice Break milk have partnered to create a coffee flavoured version of Nutri-Grain cereal. The cereal will only be sold for a limited-time but Marketing Director at Kellogg’s Australia, Tamara Howe said the aim is to target Australians who have little time for eating in the mornings. “Many time-poor 18-29 year old Aussies struggle in the mornings, wanting to sleep in rather than eat breakfast and get their coffee fix before they have to run out the door to live their unstoppable lives,” Howe said. The product has received a 4 star rating on the Australia Federal Government’s health star rating system. Kellogg’s reformulated Nutri-Grain in October 2015 in order to produce a healthier cereal that achieves a 4 star rating. Ice Break flavored milk is owned by Australian dairy company Parmalat which also owns Oak, Soy Life, Breaka and Rush milk brands. Ice Break flavoured Nutri-Gain is available now at Woolworths supermarkets Australia-wide. The recommended retail price is AUD$4.79 for a 290gram box. Arnott’s and Messina Gelato have teamed up to create an ice cream inspired Tim Tam range.